The top UK firms need more leadership from government to close the ethnic diversity gap, argues Ken Clark. Ethnic disadvantage in the labour market has been well documented in recent years. In the UK, as in many other countries, some non-white groups face restricted access to employment and suffer lower wages when in jobs. These differences persist even after differences in educational qualifications and other characteristics likely to affect labour market success are taken into account. The Blair government put ethnic labour market disadvantage at the heart of policy with a high-level report and task force which from 2003 onwards sought to improve the human capital of minority groups, match them better to jobs and reduce direct racial discrimination. While specific initiatives had some success, at the onset of the financial crisis it was still the case that, for many ethnic groups, employment rates and earnings lagged those of similarly qualified White British workers. Since 2010, the Coalition’s priority has been debt and deficit reduction and there has been less emphasis from government on race equality in the labour market. By contrast the issue of improving female representation in the boardrooms of top UK companies was explicitly mentioned in the Coalition Agreement, a commitment which led to the establishment of the Davies Review. Davies recommended a (non-binding) target of 25% female representation on the boards of top companies. Progress towards this has been rapid, with a figure of 23.5% achieved by 2015. The emphasis on the top end of the labour market reflects the desire to shatter the ‘glass ceiling’ that has traditionally curtailed the career progression of women and minority groups. A Race for Opportunity report suggested that only 1 in 13 of management positions were held by people from non-white ethnic minorities compared to their 1 in 10 share of those in employment. Furthermore, work by the OECD has emphasised the importance of role models in senior positions as a way of raising the aspirations of young people from ethnic minority communities. We should therefore be concerned about the ethnicity of who is running UK PLC. The figure below shows the proportion of those employed in England and Wales who are working in managerial or professional occupations. The data are drawn from the 2011 Census. While some ethnic groups do well in comparison to the White British (e.g. 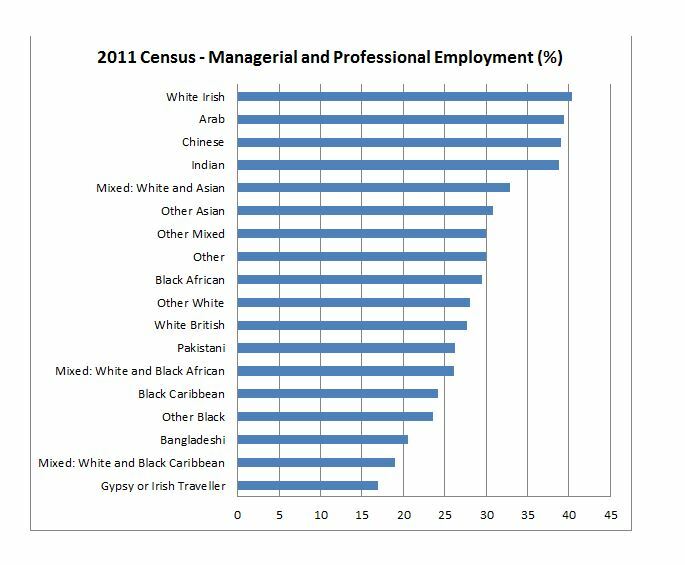 the Irish, Chinese, Indians and Black Africans), there are others – notably, Bangladeshis and Black Caribbeans – whose numbers lag behind. However, it is important to dig beneath these figures. First, the high proportions in management for some groups may be due to high rates of self-employment, which themselves reflect restricted access to paid employment because of racial discrimination. Second, previous work by Steve Drinkwater and myself found that, even within occupations such as management, non-white groups often suffer a wage penalty. A recent report for the Joseph Rowntree Foundation by Malcolm Brynin and Simonetta Longhi confirmed this, showing that even amongst higher managers and professionals, 9.5% of Bangladeshis earned less than the living wage (compared to 2.6% of whites). Third, some of the groups with relatively high proportions in managerial and professional occupations also have relatively high numbers at the other end of the jobs hierarchy (e.g. Black Africans). In the absence of a consistent focus on ethnic employment from government, there is some evidence of an increased private sector interest in the importance, and indeed the benefits, of racial diversity in top roles. An influential McKinsey report examined the ethnic diversity of the leaders of 366 publicly-listed companies across a variety of sectors in the UK, US, Canada and Latin America. A correlation was found between diversity and financial performance. Specifically, companies which were in the top quartile for racial diversity were 30% more likely to show a better financial performance than the national average in their country. The idea that profits depend on the ethnic mix of a firm’s managers is a powerful message that we might expect to make shareholders, and hence boards, sit up and take notice. Increasingly, large corporate recruiters are setting and publishing ethnic diversity targets. Examples include PwC, KPMG and the BBC. The ‘High Fliers’ study of the graduate recruitment activities of the 100 “best known and most successful employers” in Britain asks its panel of employers each year what their major challenges will be for the year ahead. For 2015, achieving diversity targets for women and ethnic minorities was mentioned by 61% of firms. This was the second most mentioned challenge, behind improving students’ impressions of their organisation. There is then something of a quiet diversity revolution taking place in the boardrooms of UK PLC. However, it is debatable whether this is enough to address persistent ethnic inequality in the labour market, especially in the absence of stronger leadership from the state.